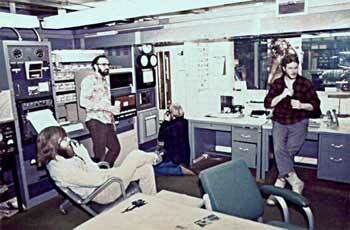 14 August 1977, we're in the met office waiting for the temperature to drop to the magic -100ºF/-73.3ºC. My photo...from left, Gary Rosenberger, Jerry Gastil, Lee Sundblad, Lloyd Anderson. 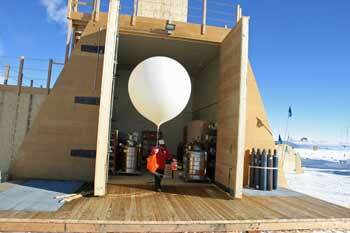 A January 2004 balloon launch...from the BIF...a classic photo, as there's not only the original wood SIP panel doors, but also a wood floor launch platform. All long gone now, including that BIF. Photo by Glen Kinoshita. The weather...How cold is it really? F or C? Real-time data is still out there in a few places if the satellites and AWS's are up. Try your luck, as not all of the AWS sites are up at the moment. Unfortunately what all of these automated sites lack is, after all, the WEATHER! The new station has WINDOWS, unlike the old met office in the dome, but the met person still has to walk outside to see everything that is going on. A current Pole weather page complete with the Wisconsin sat photo, with thanks to Steffen Richter! The BAS folks have a comprehensive met section with links to weather at Pole and other major stations. From NOAA, current Pole weather covering the past 24 hours. from NOAA, various data is here, lots of newer stuff! Also from NOAA...here's their detailed index to ALL the met and atmospheric information from...everywhere. from the NICO AWS 70 miles east of Pole (here's the graphical view). HENRY, 70 miles north. Take your pick (graphical version). South Pole weather from Accuweather. Here's the Willy Field AWS near McMurdo (graphical view). The Palmer (Amsler Island) AWS: (station page) (doesn't look like it is recording current info). Palmer Station weather and forecast from timeanddate.com. (here are links to the Antarctic Meteorological Research Center (AMRC, University of Wisconsin) data pages: home page and station map) with links to current and historical data, photos, and other information about everything.